1. The Indian economy grew 8.2% — the highest in two years — in the April-June quarter, driven by robust growth in the manufacturing, construction and farm sectors. 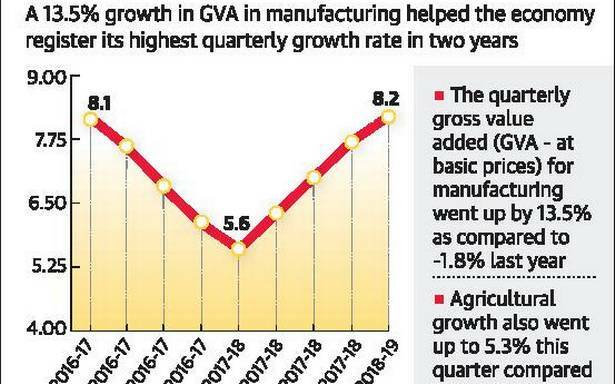 The manufacturing sector grew 13.5% in the first quarter of 2018-19, as against a contraction of 1.8% a year earlier, while the construction sector grew 8.7%, compared to a growth of 1.8% in the first quarter of last year. 2. Chief Minister Arvind Kejriwal took to Twitter on Friday to announce that residents of Delhi will be able to avail of doorstep delivery of various government services, including driving licences, marriage certificates and ration cards, from September 10. Get Daily updates, Latest Current Affairs For CDS and NDA to prepare yourself with The Tutors Academy. 3. The first round of the India-U.S. 2+2 talks at the level of External Affairs Minister Sushma Swaraj and Defence Minister Nirmala Sitharaman and their counterparts Secretary of State Mike Pompeo and Defence Secretary James Mattis is scheduled for September 6 in Delhi. 4. Adding another category, Census 2021 will collect data on Other Backward Classes (OBC), the Centre said on Friday. The decennial exercise will involve 25 lakh enumerators, and “maps/geo-referencing at the time of house listing is also under consideration,” a Home Ministry statement said. The Census Organisation was set up on an ad-hoc basis for each Census till the 1951 Census, when the Census Act was enacted in 1948 to provide for the scheme of conducting population census with duties and responsibilities of census officers. As per the 2011 Census, the country’s population stood at 1.21 billion, almost equal to the combined population of the U.S., Indonesia, Brazil, Pakistan, Bangladesh and Japan put together [1214.3 million]. 5. The BIMSTEC (Bay of Bengal Initiative for Multi-Sectoral Technical and Economic Cooperation) is a regional grouping comprising India, Bangladesh, Myanmar, Sri Lanka, Thailand, Bhutan and Nepal. 6. The first face-to-face engagement between the new Pakistani government and India could come later this month when External Affairs Minister Sushma Swaraj and Pakistan’s Foreign Minister Shah Mehmood Qureshi attend the SAARC (South Asian Association of Regional Cooperation) Council of Ministers’ meeting in New York, officials in Delhi and Islamabad confirmed. Prepare yourself with The Tutors Academy and get daily Latest Current Affairs For CDS and NDA. 7. Pakistan’s diplomat Amjad Hussain B Sial on 1 March 2017 assumed office as the Secretary General of the South Asian Association for Regional Cooperation (SAARC). Sial succeeds Nepal’s Arjun Bahadur Thapa, who was appointed the Secretary-General in 2014. 8. India has invited Pakistan to visit sites of the Pakal Dul and Lower Kalnal hydro-electric projects on the Chenab. India and Pakistan concluded the 115th meeting of the India-Pakistan Permanent Indus Commission (PIC) in Lahore from August 29-30. The Indian delegation was led by P.K. Saxena, the Indian Commissioner for Indus Waters. 9. As per the provisions of the Indus Waters Treaty 1960, technical discussions were held on implementation of various hydroelectric projects including Pakal Dul (1000 MW) and Lower Kalnai (48 MW) in Jammu and Kashmir. 10. The 4th BIMSTEC Summit concluded on Friday with Nepal Prime Minister K.P. Sharma Oli handing over the chairmanship of the grouping to Sri Lankan President Maithripala Sirisena (in picture). Mr. Oli, the current chair of the BIMSTEC, presented a draft of the Kathmandu Declaration, which was unanimously adopted by the member states. Latest Current Affairs For CDS and NDA from The Tutors Academy. 11. Voicing concern over the adverse impact of climate change, India and six other BIMSTEC nations decided to explore the possibility of establishing an inter-governmental expert group to develop a plan of action for a collective response as they reaffirmed their commitments to the 2016 Paris Agreement. The member states resolved to protect the environment. 12. The European Union (EU) said on Friday that it would propose a legal change that would end the ritual of switching between summer and winter time, leaving it up to governments across the bloc to agree on whether to permanently use summer time or winter time. The proposal comes after a survey found that 84% of 4.6 million citizens across the EU’s 28 member states opposed changing the clocks ahead in the summer or back in the winter. 13. Japan’s Defence Ministry on Friday made its biggest-ever budget request, seeking better missile defence and bolstered air power amid ongoing threats from North Korea and China. The Ministry wants 5.298 trillion yen ($47 billion) for the next fiscal year, the seventh straight annual increase and 2.1% more than last year. 14. Longer duration motor third party insurance cover is all set to become mandatory for new cars and two-wheelers as scheduled from September 1, with the Supreme Court on Friday refusing to extend the deadline. A bench of Justices Madan B. Lokur and S. Abdul Nazeer dismissed an application filed by the General Insurance Council (GIC) seeking extension of the deadline set by the apex court. 15. In a significant move, Chinese smartphone maker Xiaomi has decided to migrate its cloud servers to India to store data locally. 16. Idea Cellular has merged Vodafone India with itself to create the country’s largest telco with a subscriber base of 408 million, overtaking Bharti Airtel. The merged entity, Vodafone Idea Ltd., will have Kumar Mangalam Birla as the chairman. Varsha Gautham and Sweta Shervegar, silver, 49er FX women’s sailing. Harshita Tomar, bronze, Open laser 4.7. Varun Thakkar and K.C. Ganapathy, bronze, 49er men’s sailing. India men, bronze, squash team event. 18. Two Indians, Bharat Vatwani and Sonam Wangchuk, on Friday received the Ramon Magsaysay award, popularly known as Asia’s Nobel Prize. Cambodian activist Youk Chhang, Filipino Howard Dee, Vietnam’s Vo Thi Hoang Yen and East Timor’s Maria de Lourdes Martins Cruz were also honoured for their work at a ceremony in Manila. All of them have worked for the poor or those who have suffered violence. Meaning – fail to resist pressure, temptation, or some other negative force. die from the effect of a disease or injury. Get the news headlines, Latest Current Affairs For CDS and NDA with The Tutors Academy.